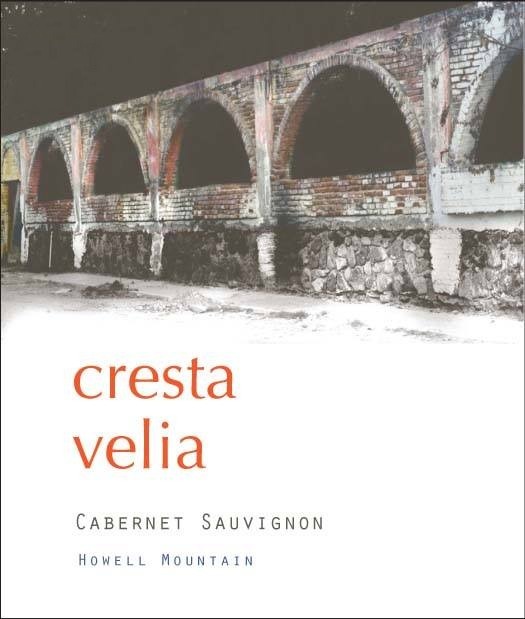 Cresta Velia Cabernet Sauvignon Howell Mt. is made from 100 percent Napa Cabernet Sauvignon. Here we go again. It seems as though I’m saying the same thing year after year. Another excellent vintage from Howell Mountain. And once again it’s true. The wine shows deep purple color concentration with both sweet and savory aromatics on the nose. Blackberries, currants, freshly turned soil and black licorice attack your nostrils from the glass. Rich, broad and full bodied as this wine is the vineyard once again provides the balancing influence of acidity and tannin and helps usher in the finishing notes of roasted meats, cigar box, fennel and more black and blue fruit. If 2012 and 2013 Cresta Velia had a baby it would be the 2015. Incredible concentration from the 2013 with generous portions of fruit from 2012. And although you are not supposed to have a favorite child, if I had to choose I think it would be 2015...until we release the 2016. Winemaker and founder John Giannini named Cresta Velia for his mother and grandmother - combining his mother’s maiden name (Cresta) with his grandmother’s first name (Velia). Cresta Velia’s inaugural vintage was the 2009 Cabernet Sauvignon and now also includes a Sonoma Coast Pinot Noir label. Cresta Velia’s Cabernet Sauvignon hails from Eagle Summit, a beautifully farmed hillside vineyard on Howell Mountain, overlooking Napa Valley. Thin soils underpinned by volcanic bedrock force the vines to delve deep in search of water and nutrients, producing wines with an ineffable sense of place. John Giannini founded Cresta Velia in 2006. John grew up in an extended Italian family – wine was always served with food. He considers both to be inseparable from one another. He comes to Napa from a restaurant background – first working at Scallas Bistro in San Francisco. He was introduced to Napa wines by a server at Scalla’s who would often visit the valley. John would accompany him on these day trips; his appreciation for wine grew. Eventually he moved to Napa and worked at Terra Restaurant. For winemaker, John Giannini, delicious wine and good food are the essential components of a life well lived. Hailing from San Francisco, two things were pivotal for John growing up; coming from a large Italian family and having parents who liked to go out to dinner. John’s family was no different than other typical Italian families for whom good food was paramount, wine was always on the table, and one or more members of the family dabbled in winemaking (John’s Grandfather). John and his siblings always got the requisite sip of wine on special occasions and grew up understanding that good food and wine go together. Equally as formative was that John’s parents took John out to dinner a lot when he was growing up. A lot. John was encouraged to order off of the full “adult” menu and was exposed to flavors and food combinations at a young age that most people do not experience until they are adults. John’s first restaurant job was as a server at a local restaurant in San Francisco while he was in college. However, it became immediately clear to him that he was not a front of the house guy and that he belonged in the kitchen; and if you know John you know that sounds about right. A year or two later, he bought a paring knife and a chef’s knife when he was hired, with next to no experience, to work in the kitchen at Kuleto’s in Burlingame, CA. He was hooked from the start, not only on the energy of the kitchen but on learning to create food. From there John spent fifteen years as an accomplished chef in restaurants on the West Coast, including Chef Hiro Sone’s Terra Restaurant in Napa. He was on the trajectory to becoming Chef de Cuisine with plans to eventually open his own restaurant until he worked his first harvest in 2003. Like so many people who end up working in the wine industry, one can look back on a chance encounter or conversation that set the wheels of fate in motion. John met Thomas Brown through mutual friends while playing volleyball and it was Thomas who gave John his first job during harvest in the Napa Valley in 2003. Everything about the harvest season was exciting and compelling and created a lasting impression however, John was still not quite sure that he was willing to give up on his first passion. Moving to Portland, OR in 2004 to help open a friend’s restaurant was to be his last foray in the restaurant business and by the time harvest of 2005 rolled around, John moved back to stay. He worked that harvest, and every harvest since, making a promise to not miss another harvest again. And he hasn’t. In 2006, John became the Cellar Master at Outpost Winery in Angwin and in 2007 he took over as the Assistant Winemaker under Thomas. Since then, John has helped craft many of the 100 point wines that have come out of Outpost winemaking facility. And while he continues to be the Assistant Winemaker at Outpost, the next logical step was to become a winemaker in his own right; and so Cresta Velia was born.